248 pages | 14 B/W Illus. draws on real-life case studies to aid understanding and includes a list of annotated list of further reading at the end of each chapter. Written in an approachable, conversational style and aimed at undergraduate students with little or no prior knowledge of linguistics or law, this book is essential reading for those approaching this topic for the first time. "Kaplan tells us, "there is literally no better training for law than linguistics," then backs this up his claim with vivid examples of criminal cases that result from simple police stops, Miranda warnings, police interviews, confessions, perjury, and courtroom testimony. But that’s not all. He does the same with civil cases involving disputes about contracts, trademarks, and the interpretation of statutes, all of which include fascinating stories that convince readers that language and law are closely intertwined. The author’s refreshingly readable, informal style is bound to have an immediate appeal to both experts and novices. This book is an excellent choice for teachers to use as they introduce this fascinating topic either to students of law or linguistics." 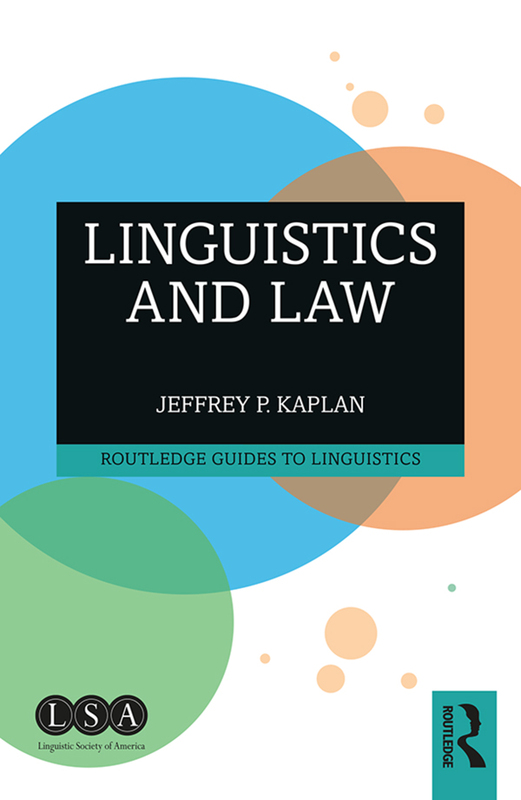 "In this book, Kaplan clearly and engagingly demonstrates how many legal issues raise questions that could be best addressed through applying a scientific understanding of how language works. Whether the reader has a grounding in linguistics and is interested in how linguistic analysis could apply to issues in the law or the reader is legally trained and wants to understand how legal analysis could benefit from the science of linguistics, this book will be equally indispensable." Chapter Two. Detention and arrest. Chapter Four. Understanding recorded talk. Chapter Five. Crimes of language (and one tort). Chapter Six. The "language" of the law. Chapter Eight Statutory and Constitutional Interpretation. Jeffrey P. Kaplan is professor of linguistics at San Diego State University, USA and a research associate affiliated with the linguistics program at Western Washington University, USA.